Large, firm, yellow flowers with a wide apricot halo. Large, sturdy leaves, upright grower. Large, velvety red, ruffled flowers on an upright, sturdy grower. 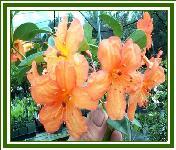 Long lasting flowers. 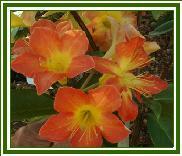 Large, firm flowers of deep orange with deep yellow throat. Sometimes orange appears more as close stripes rather than solid color. Large sturdy leaves, upright grower. Repeat bloomer.